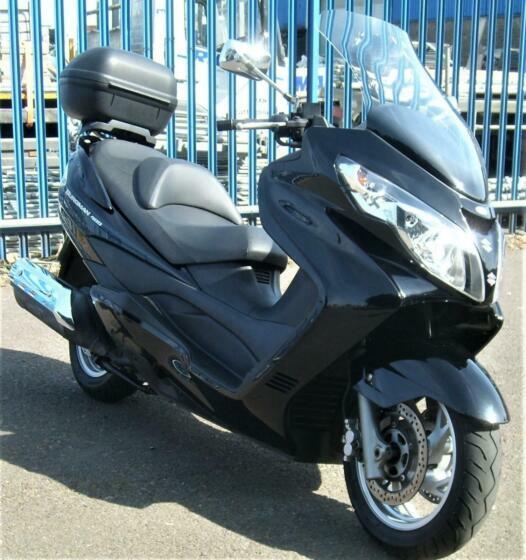 The latest Burgman 400 is now a true 400cc compared to the 385cc powering the previous generation and up 1bhp to boot. It's still a liquid cooled four stroke single cylinder engine, producing 33bhp at 7,300rpm and maximum torque at 5,800rpm. Improvements over the previous generation include a new higher seat height of 710mm (up 15mm), 0.5 litres higher fuel capacity, new lights, bodywork and taillight. There is also a new windscreen offering better wind protection, a new dashboard design and now dual front discs. The larger 14" front wheel takes a 120/80 tyre and the rear 13" wheel a 150/70. Storage is still excellent with 62 litres under the seat, enough for two full face helmets, then there are three glove boxes as well. One is large, lockable and has 12v power for charging your mobile while there other two are smaller. The special edition Burgman 400Z comes in black and adds a few extras. You get a tinted sports screen, heated grip, hand guards, rear Aluminium spoiler, black wheels and white dashboard. It's also known as the AN400 and the Skywave.